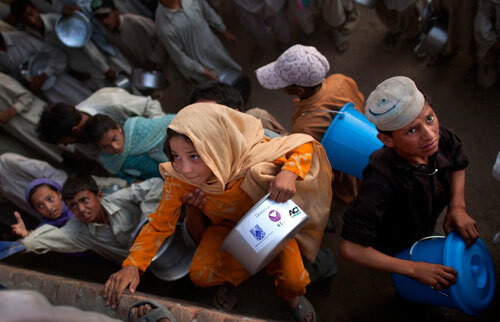 Children climb a wall to get to the front of the food line as Pakistani internally displaced (IDPs) push and shove to get food for dinner at the Chota Lahore relief camp housing thousands of people May 29, 2009 in Swabi, Pakistan. The camps are growing by the day and unable to provide all the basic needs for everyone, battling the extreme heat. Pakistan was hit by intense violence throughout 2009. Conflict between the Pakistani army and the Taliban (armed opposition groups) in the North-West Frontier Province and in the Federally Administered Tribal Areas (FATA) displaced more than two million people, while numerous bombings in major Pakistani cities killed hundreds and injured thousands. This essay looks at the community of the displaced. Forced out of their villages into over-crowded refugee camps, their everyday life has become a struggle to survive. As the days worn in the punishing heat of the summer, the aid organizations, set up temporary schools, men bathed in the canals and the people attempted to carry on with some kind of normal life.